I have been blogging since 4 years and at the initial stage, I started my first self hosted WordPress blog in a free hosting site. I was fully satisfied with my free hosting provider but my satisfaction was going to be one of my worst case scenario. My blog traffic was increasing daily and with in 3 months I have earned 356$ with my WordPress site hosted in a free hosting server. One day in the fine morning, I tried to login in to my WordPress dashboard but when ever I hit enter I was redirected to a page showing some advertisement. I thought it was some technical fault but it wasn’t then I thought to login into my cpanel and I tried 100 of times the reply was same “username and password doesn’t exists”. Then I realize that I have done a silly mistake that a silly person will do, you will never believe that I have never taken a single backup of my website. All my post comments were deleted and now I was a beginner in the blogging field. This post is just for you to never repeat the mistake that I have done before, therefore I am showing you the best technique to backup WordPress site and database. Remember, never neglect the backup process of your website because none of the webhost is 100% safe and secure therefore we should always be on our safe side to overcome any types of problem that may occur in the future. Let’s get started with manual backup process of WordPress site from your cpanel. It is an easy backup process of a website done by many web developers. The process is lengthy but being a blogger or a website owner you have to learn this process because it is very important and effective process of website backup. Login to your website Cpanel then search and click on File manager to open your website web directory. You can see your all of the WordPress php files inside the directory. Click on Select all to select all the files and folders. Now, its time to compress all the files into Zip folder and in order to compress the file right-click on your cpanel and then select Compress. Right click and Download the compressed file cgi-bin.zip. Note: Delete the Zip file after downloading because it is directly accessible by your website visitor. Above, I have demonstrated the way to backup your WordPress website files but you are not done yet. Now, you have to backup your database and in order to backup simply login to your cPanel. 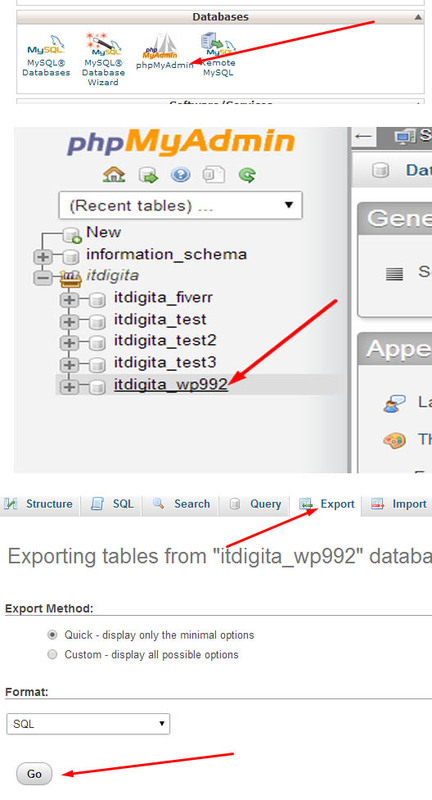 Go to phpMyAdmin, select the database of your WordPress site and export it by clicking on Export and finally you are done. Here, I have shown you the complete process to backup WordPress site and database by using the manual process and further I will show you the guide to back by using a WordPress plugin that takes automatic backup of your website in Google drive in my future post. However, there are many perfect ways to backup your WordPress site but I have shown you this trick because it is an essential trick that every blogger and website developer should know. It is the manual process done by yourself therefore there is no any chances of being wrong. Now, all I am looking is your nice and valuable comments below because your suggestion will help me a lot to motivate myself and to look forward in this blogging field.